Gobo is available year-round, but its true season is the fall to winter months. 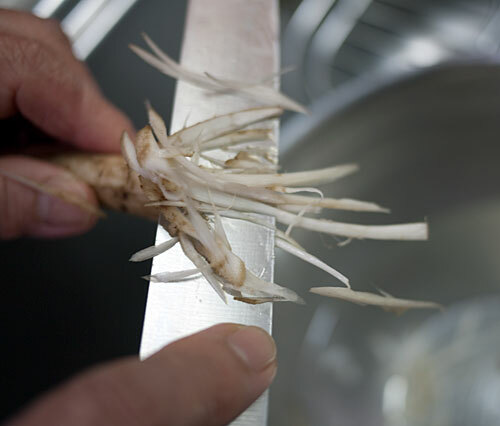 Since the root is quite fibrous, one of the usual ways to prepare it for Japanese recipes is to shave it very thinly. This cut is called sasagaki (笹掻き), which means to cut something as fine as sasa no ha(笹の葉) or bamboo leaves. 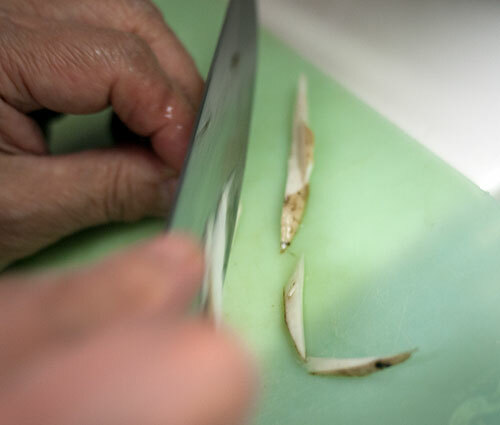 It's not a cutting method you encounter in other cuisines, so here's how to do it step by step. 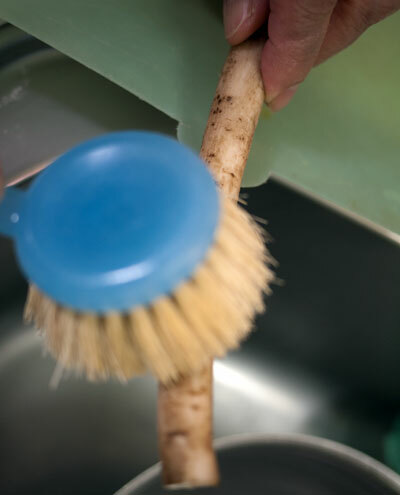 First, scrub the surface of your burdock root well. In Japan you would most likely use a tawashi or natural bristle scrubber, but you can use a vegetable brush. There's no need to peel the roots. 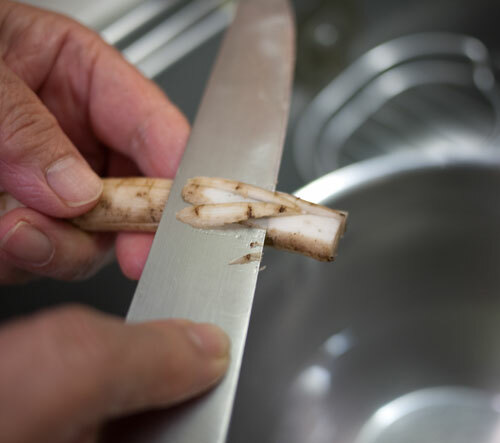 With a sharp knife, make vertical cuts into the root, about 7 inches (20cm) from the end. Hold the uncut end of the root. 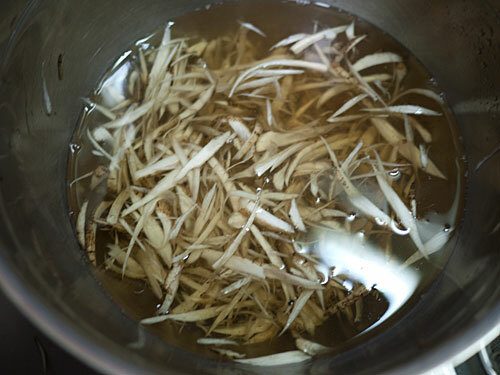 Now shave the cut end of your root thinly, preferably right over a bowl of water to catch the shavings. Pretend the root is a pencil and you are sharpening it. Rotate the root as you go. The shavings should be quite fine and thin. Keep going until the part you are cutting (where you put in the vertical cuts) is just about gone. 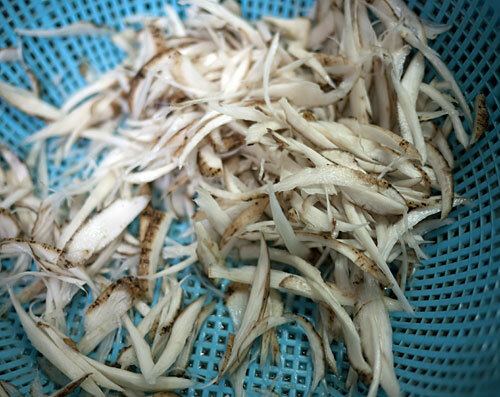 Then, make new vertical cuts into the root, about 7 inches (20 cm) or so in, as before, then keep making thin shavings. When you can't make shavings any more, just slice up the remainder as thinly as possible. There you have your sasagaki gobo. You'll notice that the water you dropped the shavings in is a yellow-brown in color. 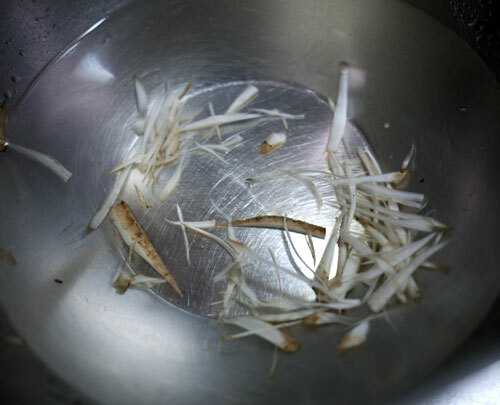 Just dump the shavings into a colander and rinse them lightly to get rid of any bitterness or overt earthiness. And voilà - perfect sasagaki gobo. This can be used as-is in soups, stir fries, and so on. 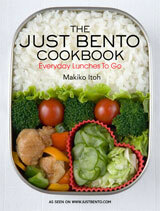 Many people prefer to use sasagaki gobo instead of simply julienned gobo in kinpira gobo. 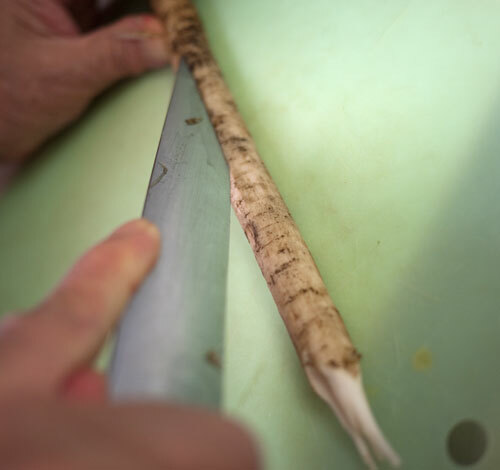 You can do the sasagaki cut on any cylindrical root vegetable. It's great for fibrous roots like salsify or parsnip, and is a nice change of pace for carrots too. It may take a bit of practice to be able to do a large mound of it quickly, but the results are really quite nice. Note: We used a rather large kitchen knife here, but you can use a small peeling knife or fruit knife instead, for better control. Submitted by maki on 2010-11-23 04:26. Your 'how to' photos are absolutely the best I've seen on the web (or elsewhere)!! Thank you for showing things so clearly. And this is an absolutely excellent technique to know. I think I'll drop some of these in my next miso soup. In rural or suburban area of the US (and probably other places in the EU, etc) burdock grows as a common weed. You can harvest it yourself if you are careful (don't trespass or take an entire population) but some people have a skin reaction to touching it. Baddock indeed grows as a weed where I live. I'd try digging some roots up myself but I'm a little afraid of picking the wrong plant and poisoning myself (I once ate weeds because I mistook them for bear's garlic so it's a valid concern!). Are there different types or is it all ok to eat? As long as you can sharpen a pencil with a knife, doing this cut on much easier to cut root vegetables should be no problem at all. Can you use a coarse grater to shave burdock? How do you cook it if you were to use it in a salad? A grater is not as sharp as a sharp blade, so it won't cut through the rather tough fibers of a burdock root as well, or make as clean cuts. I love my multi-cutter-grater thingy but sometimes the plain old knife is a better tool for a task. Oops, forgot to answer the salad question. You can just use the gobo as is in salads - it works well in coleslaw type things, or remoulade, with lots of dressing or mayonnaise. What a clever technique! I can't wait to try it out on the next batch of kinpura. thanks! Is Gobo easy to find at any market? PS: Thanks for the technique. Indeed, that is one proper way to cut it. I use another technique too but it's a bit long to explain. I'll probably post a video at some point on youtube featuring that other technique. Never heard of this root..and yeah,nice technique ! Yeah, I'd like to know this too. You make the cut into the center of the root, not just shallow cuts in the skin. Yes, I understand that, but do I go all the way through? If the burdock were 1/2" in diameter, and my longitudinal cut length 6", would I make a series of cuts 6" x 1/2"? Or would I make a series of cuts 6" x (say) 1/4" or 1/8" or 3/8"? 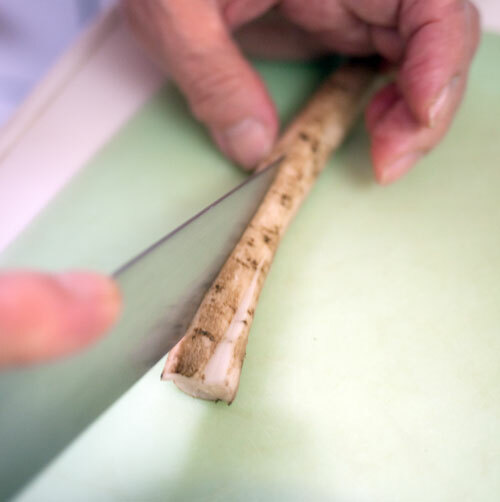 You'd cut all the way through so the cuts would be 1/2" on your 1/2" diameter root. I have one of those nifty Japanese mandolins that have a fine sredding blade. Could I use that? I have found Jerusalem artichoke is a good substitute for gobo in both flavour and texture, and it doesn't require soaking in water. Thank you so much for expanding my appreciation for Gobo. I have long enjoyed it at sushi bars and living in California I am blessed with an abundance of markets that carry it regularly. Given the latter, I searched for a recipe to attempt to make Kinpira Gogo at home. Not only did I find your instructions extremely useful...I have not been able to close the web page because I just keep reading more and more to enjoy. I first attempt at sasagaki was a delightful success! Your suggestion to use it in stir fries enticed me to include it my next meal. WOW I love it!!! It's unique earthy flavor coupled with the smokiness of the black sesame seed oil coupled for savory dish that was a hit. Next I'll attempt the kinpira gobo, which having savor the instruction multiple times, should be rather easy. Truly, I am grateful for sharing your love and passion. You've expanded my appreciation for the gobo that I've enjoy for so many years.